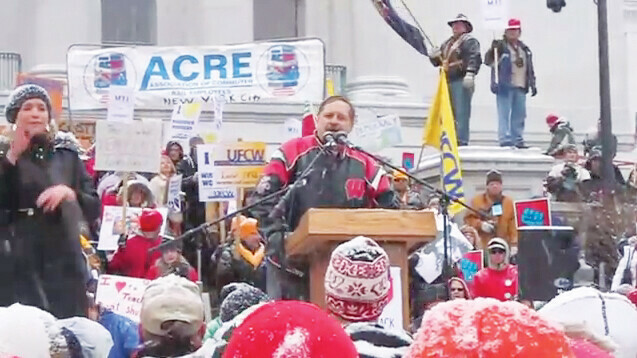 in Madison, WI on February 26, 2011. Regardless of your political persuasion, this is an emotionally taxing time for anyone paying attention to what’s happening in Wisconsin. And it’s safe to say there are more people paying attention to what’s happening right now in Wisconsin than ever before. With significant and continued on-location coverage of the battle in Madison appearing everywhere from ABC’s Nightline to The Daily Show on Comedy Central (and plenty more) – we are the unfortunate media darlings of the month. I, like many, have friends and relatives on both sides of the debate – as well as an intimate few who are right in the crosshairs. And I, like many, have a Facebook news feed that has been completely hijacked by the discussion. Well, “discussion” might be too civil of a word choice. And though as I read the comments I often wish for a little less hyperbole and a little more explorative discourse, the passion on display (from either side) is for good reason – if there’s ever been a time to care about the state of our state, it’s now. While state politics is certainly not our strong suit, most of our coverage of the situation comes on VolumeOne.org in the form of posts on local happenings related to the debate –including the rallies, protests, and events (from any side) that we catch wind of. So for the local pulse, head there.